A simple software MIDI keyboard, which uses Haiku’s built-in synthesizer to produce sound output. It can be played with the mouse and/or the computer’s keyboard, and also has an interface (In and Out) to MIDI Hardware and other apps. 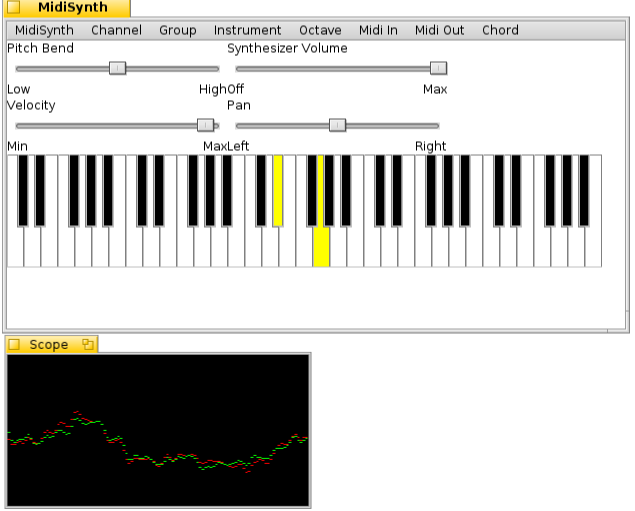 Menus let you select the MIDI channel to be used, and which GM Instrument patch should sound. Sliders can adjust Velocity, Pan, and Pitchbend MIDI parameters. Synth output volume also has a slider. To produce sound, it must have access to a SoundFont. V1.8 is updated to work in PM Haiku, and will look for SoundFonts in all the ‘…/data/synth’ folders. Author: Michael Pfeiffer et al.